IT HAS BECOME TO THE ATTENTIONS OF ULAF THAT SOMES OF YOUR MIND HAVE BECOMES CONFUSIONED. AND SO ULAF WRITES THE SELFS-HELP BOOKS, WHICH ULAF CALL “THE CONFUSIONING OF YOUR MIND,” BY ULAF SILCHOV. IN THE BOOKS ULAF EXPLORE THE CAUSE OF THE CONFUSIONING AS WELLS AS WHAT RITUALS TO PERFORM UPON IT. HERE YOUR MIND READS AN EXCEPTION OF THIS BOOKS THAT GIVE A TIPS OF POWER TO THOSE WHO NEEDED IT MOST IN THE TIME OF GREAT STRUGGLE. HELLO AGAIN VINTAGE SUPERFANS. RECENTLY, THE BENJ DECIDES TO HAND ULAF THE RAINS OF THESE BLOG POST. SO ULAF CONVERT SITE TO THE FAVORITES OF ALL THE WORLD’S KRELZ, GARDENSING. 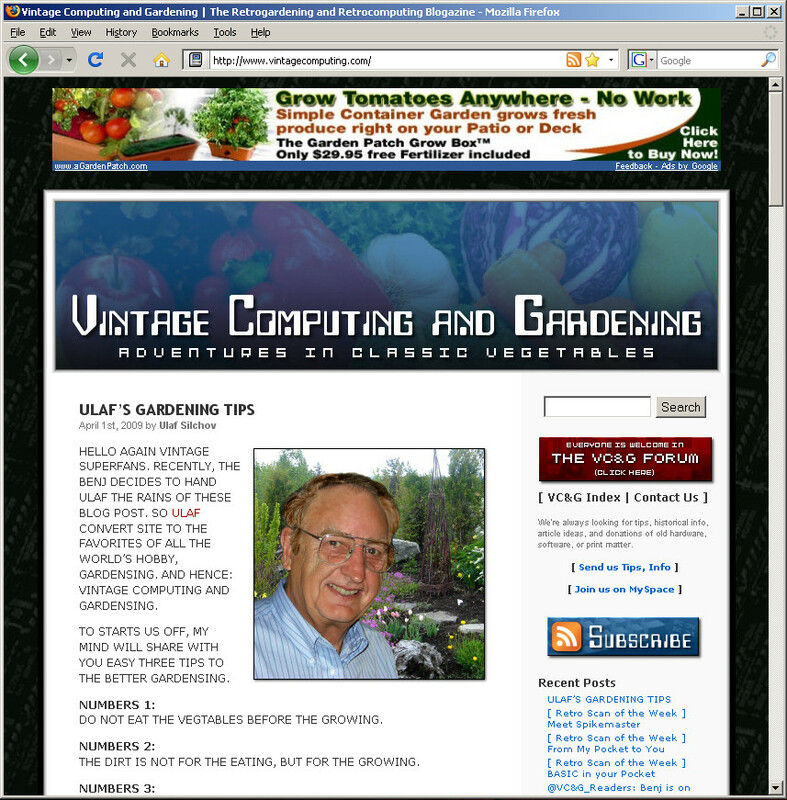 AND HENCE: VINTAGE COMPUTING AND GARDENSING. TO STARTS US OFF, MY MIND WILL SHARE WITH YOU EASY THREE TIPS TO THE BETTER GARDENSING. DO NOT EAT THE VEGTABLES BEFORE THE GROWING. THE DIRT IS NOT FOR THE EATING, BUT FOR THE GROWING. THE WORMS ARE FOR THE GROWING, AND THE EATING IF YOUR MIND LACK EXCELLENT NUTRIMENT. THAT IS ALL FOR NOW. STAY TUNES FOR MORE GARDENSING TIPS AND TRICKSTERS FROM THE WHIRL OF ULAF. FOR COMPUING AND GAMINGS TIPS, CONSULT HOW TO BEAT THE VIDEO GAMES, THE ULAF CLASSIC. SOON ULAF WRITES “HOW TO BEAT THE VEGETABLES” FOR YOUR MIND TO CONSUME. UNTIL NEXT TIME THIS IS ULAF SAYING BE THE MASTER. Yep, it’s that time of year again: time for VC&G‘s famous Video Game Halloween Costume Ideas — 2008 edition. Some video game fans have a tough time figuring out what costume to wear on All Hallows’ Eve. Every year around this time, I help them out and provide a few detailed suggestions geared towards the gaming enthusiast. These costumes are guaranteed to attract attention and garner popularity at the office Halloween party, on the street begging for candy, or anywhere in between.